The FMHACA system that houses both i-Register and i-Import. Over 12,000 unique items flow through Ethiopia’s health commodity supply chain under the management of the Pharmaceuticals Fund and Supply Agency (PFSA), supplying the nearly 20,000 service delivery points (hospitals, health centers, and health posts) across the country. 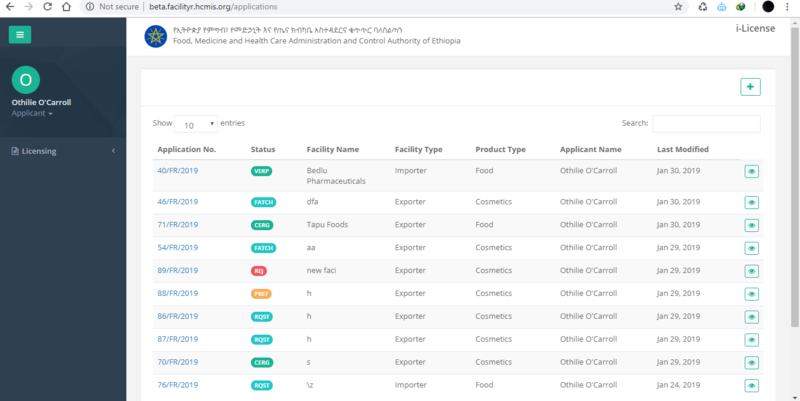 The Ethiopian Food and Drug Administration (EFDA) manages the import process for each item, working with a wide variety of vendors from multiple countries. To facilitate the import process John Snow, Inc (JSI) is collaborating with EFDA to design and implement i-Import, an online application. i-Import is Ethiopia’s new electronic medicines import approval system. It is a custom- built online platform which streamlines the approval submission and review process for EFDA and pharmaceutical importers. Funded by USAID’s AIDSFree Project and the Bill & Melinda Gates Foundation, i-Import was developed and released as part of Ethiopia’s planned open-source electronic regulatory information system, which adapts best practices from the private sector to solve key challenges in the public sector. What is the scope of i-Import? This application is designed to manage the import process for all health commodities being imported into Ethiopia – from the start of an import application to approval. What are the intended users of i-Import? i-Import is designed to support both EFDA regulatory authorities and importers who are involved in the import application process. PFSA staff with procurement responsibilities also have access to and use i-Import. The Ethiopian Food and Drug Administration (EFDA) regulates the introduction of more than 12,000 unique items into the Ethiopian pharmaceutical supply chain. EFDA manages the market authorization for each item, working with a wide variety of vendors from multiple countries. To facilitate market authorization, John Snow, Inc. (JSI) is collaborating with EFDA to design and implement i-Register. i-Register is a public domain, web-based management information system that automates medical product registration, application submission, screening, review, and market authorization processes. i-Register is an application managed by EFDA that allows importers to apply for market authorization and product registration. Using this solution, importers can register new products, renew existing product registrations, or request registration exceptions. EFDA staff can then review and communicate with vendors about their applications. Once a product is registered via i-Register, it enters the import process, which is managed by i-Import, another program. What is the scope of i-Register? This application facilitates the management, documentation, and of medication registration information. i-Register integrates the work of the Medicine Registration and Customer Service Departments and allows them to coordinate their efforts, from product registration to import authorization of pharmaceuticals, by managing the market authorization process of health commodities being imported to Ethiopia. What are the intended users of i-Register? i-Register is designed to support both EFDA regulatory authorities and applicants who are involved in the medicine registration process. Improved efficiency – Saves both applicants and EFDA staff time by allowing vendors to register their products and communicate with EFDA staff online. Increased transparency – Allows both applicants and EFDA to track the status of applications online. Workforce management – Helps EFDA department heads and managers assign applications to employees, track their workload, and follow application statuses. Request, review, and approve market authorization certificate for new products. Request, review, and approve variations on existing products. Request, review, and approve market re-authorization certificates for existing products. EFDA issues licensing for facilities like importers, exporters, wholesalers and Manufacturers. Licensing directorate of EFDA delivers activities like Issuing, renewing, suspending and revoking of license which is all done manually. To facilitate the licensing process John Snow, Inc. (JSI) is collaborating with EFDA to design and Implement i-License, an online application. i-License is a web based management information system that automates facility information like importers, exporters, wholesalers and manufacturers. i-License is application that allows importers, exporters, wholesalers and Manufacturers to apply for certificate of competency. Using this solution, importers, exporters, wholesalers and Manufacturers can apply for certificate of competency online and get their certificate in short time. The online application also allows them to apply for renewal and change or variation in the facility and EFDA staff manage these applications easily. Once a facility is registered via i-License, it is enters the market authorization and import permit process which is managed using the i-Register and i-Import software application respectively. What is the scope of i-License? The application manages applications for licensing and the documents that the applicants upload. Then it finally generates certificate of competency. It also manages application for renewal and changes of facilities. Who are the intended users of i-License? i-License is designed to support both EFDA regulatory authorities and facilities like importers, exporters, wholesalers and manufacturers that are involved in product registration and import process. Improved efficiency: Reduces applicant time as applicant submits applications from their office. System provides a back and forth feedback mechanism between applicants and EFDA staff who are assigned to process the application. Increased transparency: Allows applicants to follow his or her application status online as the application moves from one processing stage. Improved data quality: helps to improve data consistency, data quality, and entry time and reduce data errors. Request, review, and approve certificates for changes on existing facilities.